Perhaps one of the most common age-related illnesses that we know of today is dementia. It has affected more than half of the senior population in the country today. It is not something that we should take lightly. We must be aware of their symptoms and causes as these subtle signs may already be notable in your senior loved one. To understand the nature of dementia, it would be best to debunk common misconceptions of dementia before you get an in-depth knowledge of it. We will list down the three myths about dementia that you have believed in for years. 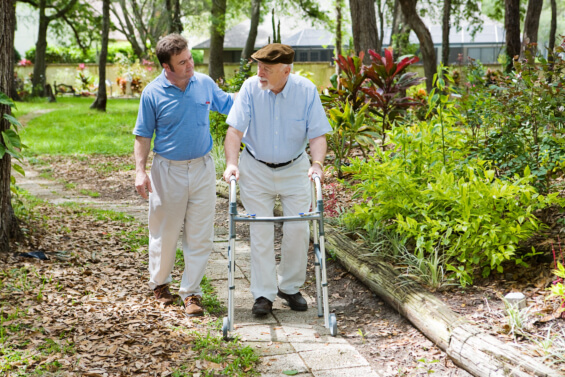 As your partner in senior home care services in Georgia, Abundant Life Assisted Services hopes to keep you aware of these timely health issues. In medical terms, dementia is a general term for any condition that involves the degeneration of neurons causing memory loss. Alzheimer’s disease is only a type of dementia. Hence, when your doctor starts talking about dementia, it would be best that you ask what kind of dementia he is talking about. He may be able to give you another kind of treatment rather than the one that you previously know of. We tend to associate memory loss as part of aging. We think that if our moms and grandparents are starting to be forgetful, it is normal because they are old. But memory loss is not affected by aging in any way. Gradual and constant forgetfulness is an abnormality in the brain that should not be taken lightly. If you think that the kind of memory loss that your loved one is currently manifesting is not normal, you have to have it check with your doctor. In this manner, you will get an expert’s analysis of their condition and you will know how to deal with it better. We have already settled the fact that dementia is not part of the body’s cycle, now, we have to agree on the fact that it is no way hereditary or genetic. Just because your parents’ have a history of dementia, it does not mean that you will automatically have one too. Maybe there is a possibility for you to acquire dementia due to genetic reasons but apart from that, you can still be safe. Moreover, dementia can also be prevented to a certain extent. If you see that you are exhibiting the signs of early dementia, you can still prevent it from getting worse. Just ask your doctor or your caregivers from Abundant Life Assisted Services, an in-home elderly care provider, for the possible treatment. What are the other facts that you have heard about regarding dementia? Maybe we can discuss it over the phone or schedule a consultation with our care coordinators. Do not let aging or dementia get the best of you. You have the right to enjoy your life and fight off the disease and illness you face. For queries and reservations, you can check our website at www.alascare.com or call us today at 678-319-0307. This entry was posted in Caregivers, Elder Care, Home Care and tagged Dementia, Health, Health Care, Home Care, Senior Care Services. Bookmark the permalink.